Based on a satellite view of the West Bank at Qalqiliya. Jacob is Abraham's grandson, son of Isaac, and in this passage Jacob becomes Israel. "Israel" literally means one who has wrestled with God. The carving on shina plywood. I love this image for so many reasons. First, I love the idea of wrestling with God. My own personal relationship with God has involved a whole lot of wrestling, so I'm happy to know that I'm following a tradition. And I love what Jacob says to the angel. "I will not let you go until you bless me." Amazing chutzpah, to demand a blessing from God. I like that. And I love the sense that the angel is hardly struggling, that the angel is letting Jacob win like a parent allows a child to win sometimes. All of the struggling is really being done by the man, not the angel. In any peace talks between Israelis and Palestinians, one of Israel's main conditions is the demand that Israel's right to exist be recognized. Which is kind of a demand to be blessed, so I like this image for that. But there's another side to any demand for a blessing. When we struggle with our hardships, with our challenges, if we stay in the struggle long enough and refuse to let go, it is possible to discover the blessing that lies within the hardship. So I see this image as calling for a struggle with our higher natures. Which I guess is what I want to hope for. I want to believe that at some point one of the parties will have enough sense or incentive to step out of the stranglehold they have each other in and see that nobody can win. Salman Rushdie wrote, "There comes a point in the unfurling of communal violence in which it becomes irrelevant to ask, 'Who started it?' The lethal conjugations of death part company with any possibility of justification, let alone justice... Both their houses are damned by their deeds; both sides sacrifice the right to any shred of virtue; they are each other's plagues." They are each other's plagues. Their fates are completely intertwined. Whether Israel and Palestine become two states or one state, they can't escape each other. They are one people with one problem. Maybe they can become each other's angels. Maybe they can squeeze a blessing out of their struggle. That's what I hope for Israel and Palestine. I can understand the comparison of life in Gaza or the occupied West Bank and life in modern day Native America. But Jews also make valid claims of indigneity to Israel. There is an enormous body of archaeological and historical evidence demonstrating a long connection that the Jewish people have to the land. Nevertheless, the population of Israel has never been monolithic. The area has been continuously settled for tens of thousands of years and a short list of the various peoples who have lived there would include Neanderthals, Hittites, Philistines, Hebrews, Assyrians, Babylonians, Persians, Romans, Arabs, Turks, British and French. 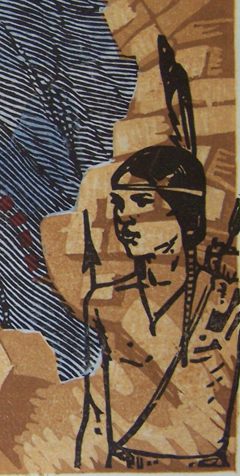 Claims of indigeneity could authentically be made by a lot of different people. I agree with the native American youth, however, that the plight of the Palestinians resembles the plight of America's native peoples. Lots of news this month! Last year I was selected, along with 99 other area artists, for inclusion in a new book from Schiffer Publishing Ltd. called 100 Artists of New England and I just got word from author E. Ashley Rooney that the book will be available next month. This coffee table-style book includes artists working in a wide range of media and it's part of a series from Schiffer that looks at working artists from various parts of the United States. Each artist is profiled in a full-color spread that includes a photo of the artist, a number of examples of their work, and their artist's statement. The book can be pre-ordered online at Amazon and Barnes and Noble. I can't wait to see it myself! 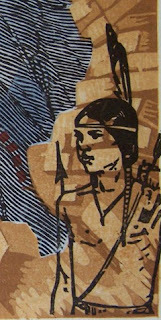 I was happy to learn a couple of days ago that one of my prints, Dorothy Bradford Comes to America, will be included in the exhibition "Mokuhanga: Dialogue and Dialect" which will be part of the 1st International Moku Hanga Conference in Kyoto in June. I'll be attending the conference along with Dorothy, and I can hardly wait to be in Japan again. I'm also very excited to meet many moku hanga artists who I've only known virtually for so many years. The show will be up June 8 -12, 2011 at Kyoto International Community House, 2F. Listings of other woodblock shows in Kyoto during the conference are available here on the conference web site. The story of Abraham and his sons is one of those long and winding soap-opera kinds of Bible stories. Abraham, who we might call the first monotheist, was married to Sarah who was barren. Sarah, knowing that 86-year-old Abraham longed for a son, offered her servant Hagar to Abraham as a surrogate and Hagar gave birth to Abraham's first son, Ishmael. Thirteen years later, Sarah became pregnant and gave birth to Abraham's second son, Isaac. After the birth, Sarah became angry and jealous of Hagar and Ishmael and she said to Abraham, "Get rid of that slave woman and her son, for that slave woman's son will never share in the inheritance with my son Isaac." Abraham reluctantly did so after God promised him that both of his sons would be made into great nations. Thus began what Bruce Feiler, author of Abraham: A Journey to the Heart of Three Faiths calls "the greatest family feud in the history of the world and the defining feud of our time." Isaac would become the father of Jacob, who would become Israel, while Muslims would revere Ishmael as their original ancestor and their line of direct descent from Abraham. Christians too have claimed Abraham as their spiritual ancestor and so, as Feiler says, "One man is at the heart of the religions that suddenly seem to be at war: Abraham. Abraham. Abraham." I also added a contemporary image of a woman and her children being detained at an Israeli checkpoint to this section of the print. Asymmetric warfare is conflict between parties whose relative military power differs significantly. Some examples are The American Revolutionary War, the Soviet Invasion of Afghanistan, the 2003 Invasion of Iraq, and of course the battle between Israel and various Palestinian organizations such as Hamas. I chose to illustrate this with the Bible story of David and Goliath, told in 1 Samuel Chapter 17, in which a teenaged David brings down the giant warrior Goliath with a stone fired from a slingshot. One of the many problems with asymmetric warfare is that the stronger party can easily end up looking like a bully. Photographs of Palestinians throwing rocks at armed Israeli soldiers, like the one below, make for very difficult public relations for the Israelis. The next figure on the "stage" of this print is Jesus. I was raised in a mainstream Protestant church-going family and as such I was taught that the Jews of the Old Testament had a special relationship with God. Since Jews and Christians share the same scriptures in the Old Testament, I figured that the God of the Jews and the God of Christians is the same God. I was taught that Jews who rejected Jesus as the messiah lost that special relationship, but in my mind as a child I figured that since we Christians had come from Judaism, the Jews and I were some kind of cousins. Mere political rhetoric does not account for the profound devotion to Israel that exists in the hearts of tens of millions of evangelical Christians. You must realize that the God who spoke to Moses on Mount Sinai is our God. Abraham, Isaac, and Jacob are our spiritual Patriarchs. Jeremiah, Ezekiel, and Daniel are our prophets. King David, a man after God's own heart, is our hero. The Holy City of Jerusalem is our spiritual capital. And the continuation of Jewish sovereignty over the Holy Land is a further bulwark to us that the God of the Bible exists and that His Word is true. Many Christian conservatives do not support peace initiatives in the region. Peace is not prophesied for the Middle East until Jesus comes and brings it himself, and Jesus is not prophesied to come until the Jews are returned to the land promised by God to their ancestors. Thus a Palestinian state in land that is Biblically considered "Israel" is not a possibility in this scenario. Given that he is evangelical, I'm surprised that George W. Bush offered his "Roadmap to Peace" during his presidency. I respect him for that, actually. Dr. Seuss tells another story about the Sneetches. The superior race, the ones that everybody aspires to be like and also the ones that everybody hates, are the Star-Belly Sneetches; they have stars on their bellies, and everybody else doesn't. One very clever fellow knew how predictable these Sneetches were, so he came in with a big machine that would put a star on your belly. All the Sneetches Without a star on their belly rushed in and came out with a star on their belly, but of course the original Star-Belly Sneetches still knew who and how superior they were. They weren't thrown by this at all. But to facilitate this very predictable situation, the same clever fellow came along with a new machine by which you could go in and get the star taken off your belly. So all the Star-Belly Sneetches went into this machine and came out without stars on their belly; the superior ones were now without stars. The clever fellow kept these two machines going. Sneetches were running in and out, and the money was piling up, but after awhile all the Sneeches experienced shunyata. They didn't know who was who or what was what or who was a Star-Belly Sneetch and who was a non-Star-Belly Sneetch, so after awhile they just had to look at each other without labels or opinions. Among other possible meanings, this story seemed to me an apt metaphor for the American-led peace talks that have been attempted over and over again with little success. I think it's difficult for Americans to understand that our particular secular melting-pot style of democracy is not always (ever?) translatable to other cultures and contexts. We tend to approach the middle east with a kind of "why-can't-you-just-get-along" or "why-can't-you-just-be-like-us" attitude that ignores the very real differences between the parties. America's insistence on a separation between religion and state makes us downplay the very real and powerful role that religion plays in nations such as Israel and other Arab states, which define themselves by their religious identities. At one level, we are all the same. We are all human and what we want as human beings is universal: love, family, a feeling that we are safe, a feeling that we have some freedom to choose the kind of life we want to lead. But our very real differences have to be accounted for and heard and treated with respect. This is difficult enough to do on a personal level -- how in the world can it be done at a state level? I'm not saying that I know the answer. I'm just saying that American interventions in the peace process seem kind of sad and naive and ineffective to me. On Christmas day my mother, whose home I was visiting, slipped into her office and came back with these objects in her hand. She set them down on the table in front of me and said, "Why don't you take these home with you? Your father and I brought them back with us from Jerusalem. Maybe they can help you with your woodblock print." She then went on to tell me that she and my dad had picked up the stones and the bullet shell at the wailing wall in Jerusalem during a church trip in 1994. While they were on that trip, an American-born doctor, Baruch Goldstein, opened fire at a mosque in Hebron during Ramadan and killed 30+ Palestinians. From the window of their hotel in Jerusalem, where they were confined for a couple of days for their safety, my parents watched Palestinians throw rocks and fire rubber bullets on Jews who were praying at the wall. Afterward, my father picked up these rocks and the bullet casing. The little cup is made from olive wood. It's a communion cup, a typical gift offered to Christian tourists. I was really touched when my mother gave me these items. They now sit on the work table in my studio next to my carving bench, a stark reminder of the strife I'm trying to capture in this print. This print is my entry into the Drachen Foundation's Moku Hanga Kite Contest. The print will be sparred (dowels and string added) by the folks at Drachen. After this weekend's tragic shootings in Tucson, Arizona, this image of peace and blessings feels even more resonant to me than it did when I started working on it. The kites from this contest will be shown at the 6th Annual Kyoto International (KIWA) Exhibition in Kyoto in late March, at the 1st International Moku Hanga Conference in Kyoto in June, and later at Cullom Gallery and Mighty Tieton Arts, both in Washington state. Just a quick post to show the progress I made over the weekend on the Blessings Kite. The next step was to carve away the areas of the sleeve that would stay lighter in tone. I then printed a darker orange color to give the sleeve some more definition. I carved away all the hand areas next so I could start printing the background. Notice that I did leave some of the linework at the center of the hand. That part will remain un-inked when I print but will support the paper to keep it from sagging into the carved out area. I printed a gray halo around the hand to darken the next layer of color. Then I printed a blue-to-yellow circular bokashi over the entire background. This afternoon I've been carving the cloud patterns. This is the last of the carving. One more layer of color will finish the print. Here's the progress I've made so far on the Blessings Kite. Since I'm going to make the print with just one block, I began by making an acetate stencil to isolate the hand from the background. Then I painted some gray onto the board. I put the stencil down and took the impression. This gray color may end up being too subtle. I'm just getting used to the paper that Drachen supplied, which is very thin and may or may not be sized. No time to experiment beforehand, as this print is due in Seattle next week! Next I carved away some of the hand, leaving the linework. I inked the hand in an orange/gold color and used the stencil again to take the next impression. I'll be adding a little bit of detail to the sleeve next, and then on to the background. First Project of 2011: A Kite! Happy new year everyone! I hope your holiday was wonderful and that you've entered this first week of the new year well rested and with renewed energy. I've been back in the studio since Monday and have put the Israel/Palestine print on hold so that I can work on an entry for the Drachen Foundation's moku hanga kite project. Based in Seattle, Drachen Foundation is a non-profit organization devoted to disseminating information about any and all sorts of kites from around the world. The Kite Project invites international artists to produce Japanese woodblock prints on thin washi no larger than 18 x 13 inches. The prints will then be expertly sparred into functioning kites by the folks at Drachen. The kites will be shown at the 6th Annual Kyoto International (KIWA) Exhibition in Kyoto in late March, at the 1st International Moku Hanga Conference in Kyoto in June, and later at Cullom Gallery and Mighty Tieton Arts, both in Washington state. Since I've been contemplating peace recently, I wanted to design a kite around that theme. I wanted it to be bold and graphic so that it would be easy to see even when the kite is in the air. 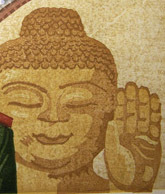 In a previous print, I had included a Buddha with his hand raised in the abhaya mudra (see image at left) which signifies protection, peace, and the dispelling of fear. I thought that it would be really lovely to fly a kite that offered protection, peace and freedom from fear to everyone below, so I decided to show the hand of Buddha in my kite. I've been calling it "Blessing Kite."